End of summer is just as fun as the beginning of summer with lots of adventure! End of summer adventures await! It’s not too late to book a last-minute vacation to get the most out of summer you possibly can! And Sterling Ridge is the perfect place to visit with tons of great activities and sights to see nearby the resort. Once you’re here, there’s a long list of fun things waiting for you to experience before the end of summer! This summer has been hot and humid, so you’ll need to cool off. On the property, just a short walk from your cabin, we have an awesome in-ground swimming pool that’s open 9am – 8pm! If you don’t feel like swimming and would rather just catch some rays, we have plenty of lounge chairs for you to use while you relax and read a book (we’ve got plenty you can borrow) or take a midday summer snooze. Looking to get some exercise and enjoy the beautiful views of Vermont before the end of summer? We have lots of hiking trails throughout the woods and two ponds for you to enjoy! Our larger pond is the perfect place to kayak, paddle, and row and fish! We have a kayak and rowboat for all guests to enjoy and fishing poles you are welcome to use. If you’re looking to get away from your cabin for the day, you won’t find yourself short of fun things to do. 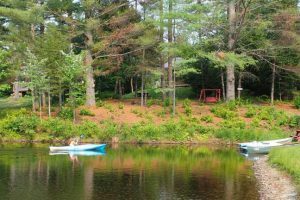 There are multiple swimming holes on the Brewster River and in Stowe, which is just a short 10-15 minute drive from your cabin. When it’s hot out, nothing is more refreshing than a swim….or ice cream! Take a little time out of your day to visit one of the ice cream stands in Jeffersonville, or take a road trip to the Ben & Jerry’s Ice Cream Factory in Waterbury, VT and take a factory tour and try some of their famous flavors! Feeling like you need an adrenaline rush? Check out ziplining at ArborTrek Canopy Adventures, a family-friendly forest amusement park with zip line tours & a treetop obstacle course right in Jeffersonville. Or are you looking for a more peaceful day? Lajoie Stables offers horseback riding, and is just a couple minute drive from Sterling Ridge! So, don’t be too sad that the end of summer is near! You’ve got some precious time left to make plans and memories. Come celebrate summer with us and get some final relaxation and vacation before it’s back to school and back to colder weather! Adventure awaits at Sterling Ridge!